If you’re looking to buy a house and want to monitor mortgage interest rates, it’s harder than you might think. I was unable to find a single site that had stock market-like mortgage rate tracking. Part of the problem is the variability among mortgage rates depending on your credit score, loan and home value and subsequent LTV (Loan to Value), your state and city, points (if you’re looking at the APY instead of the APR) and more. But I usually don’t want an exact quote, I just want to get a feel for where the rates are at. The easiest solution I found was to add three widgets to iGoogle. Note: These are static images that link to the Google widget they represent. Bankrate is the source I’ve seen used most often on other news sites so it’s first on my list. They also have a rate trend index which aggregates predictions of where the rates are headed. HSH is often referenced by TV and newspapers, so its rates (which are often higher than the other two) are second on my list. Freddie Mac brings up the rear. The rates are usually close to those of bankrate, but a tad higher. You can also do spot checks on Zillow, Freddie Mac (weekly rate averages), The Mortgage Professor (wholesale rates) and MSN. Lastly, I subscribed to the RSS feed of Zillow’s Mortgages Unzipped to hear some of the reasoning behind the rates, along with predictions for the future. This should give you a good idea of where rates are at right now, and where they may be headed in the future. Update: Mary from Zillow pointed out that Zillow has widgets. Here’s an iGoogle gadget I created to display the one below. I also found three widgets from WidgetBox. They can be added to iGoogle or embedded on your own site. These are live examples. 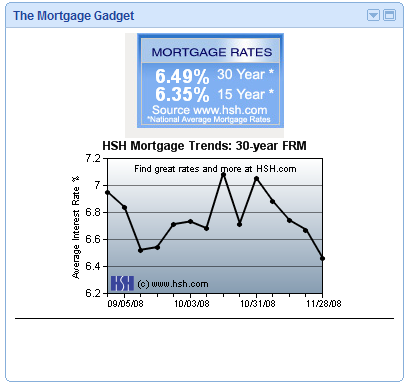 Get the Countrywide Home Loans Rate Watch widget and many other great free widgets at Widgetbox! 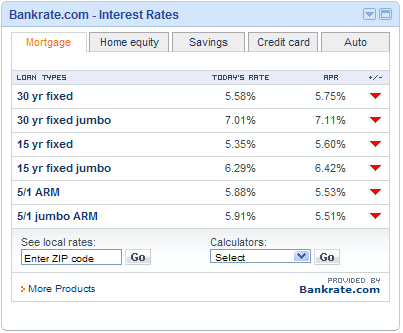 Get the Daily Mortgage Rates widget and many other great free widgets at Widgetbox! 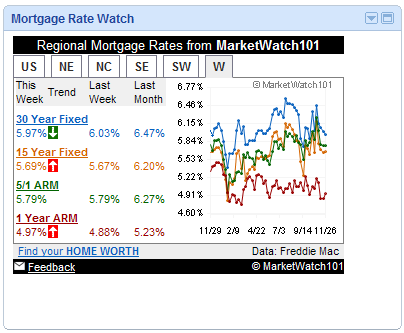 Get the SaneBull Mortgage Monitor widget and many other great free widgets at Widgetbox! Mary from Zillow here. Thanks for highlighting Zillow Mortgage Marketplace and the Mortgages Unzipped blog. The rates we show are different from other sources, since they are computed up-to-the-minute using real quotes borrowers received from lenders on Zillow. They are not taken from general rate survey data. In addition to the information on our site, we also offer 4 mortgage rate widgets that show these up-to-the minute rates. They are available in table or chart format. Anyone can download them for free here: http://www.zillow.com/mortgage/widgets. All of our widgets also offer free co-branding. When visitors click the widget, your photo, contact info and link to your Web site appears at the top of the page. @Mary Thanks for the links to the Zillow widgets. I hadn’t seen those before. Hi, I am looking at your bankrate widget and it’s exactly what I want! :) Where did you get it from or did you create it yourself? Can you tell me how I can get it, please? If you click on it you’ll be able to add it to your iGoogle page.